If you are not a gamer you might not know who Howard Scott Warshaw is. Now, known as “The Silicon Valley Therapist”, Mr. Warshaw has the more dubious distinction of being known as the man who wrote the worst video game of all time, E.T. the Extra Terrestrial for the Atari 2600 game console. E.T. has subsequently been blamed for bringing down the entire home video game console market in 1983. Suffice it to say, many of the people who might think E.T. is the worst video game of all time have never played it, or have never heard of the game Commie Bob. Howard is an unapologetic, force majeure that is unequivocally one the best programmers of that early console era. 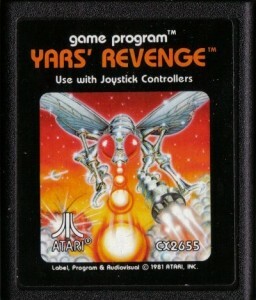 Howard’s first game, Yars’ Revenge is one of the top selling Atari 2600 games of all time and often considered one of the best ever in terms of game play. It was a revolution of art, game play, and even included a comic book that brought a backstory to a game for the first time in Atari’s history. It also happens to be the first time Atari ever gave a programmer direct credit for making a game. In fact, Howard never made a game for Atari that didn’t sell over a million copies, including E.T. There may not be another programmer in any console generation that can lay stake to that claim. We had a chance to talk with Howard about those times at Atari, leading up to the infamous E.T. a game that was made in 5 weeks, and stands as a testament to Howard’s ability: It actually works. While Howard admits to us the game is not perfect, yes, sometimes it does put the Joe Dirt in the hole, we are not sure what could be expected in 5 weeks. The complaints about E.T. are thoroughly over blown, and even as young kids none of us found the game that bad. The result of Howard Scott Warshaw being able to create a working, fairly decent game for a console in just 5 weeks is what actually saved the industry from becoming a passing fad and dismissed entirely. Had the game been assigned to anyone else, or had enough time been allotted to develop the game properly, the industry still would have crashed, but without the focal point needed for an industry to begin to recover from. Howard proved that the console had reached its limit. One of the most talented programmers of the 2600-generation proved that the sophistication of programming techniques and lack of expandability had pushed the hardware to obsolescence. The inability of Atari executives to recognize a product life cycle (Moore’s Law, hello? 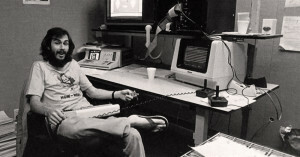 ), the constant cloning of games (similar to what happened with Pong in 1977), lead to the crash in 1983, and Howard Scott Warshaw proved why. This exact why is what lead us out of the crash. Understanding that the hardware could no longer support what gamers expected. Understanding that some kind of quality control needed to be kept lead us to the Nintendo’s Seal of Approval some years later. We can thank Howard Scott Warshaw for keeping the revolution alive and flowing. Howard has stayed extremely relevant and up to date, not fading out for a life in psychotherapy, but instead remaining grounded in tech to help his patients to the best of his ability. He is once again on the frontier, analyzing the most complex system there is: the human mind. You can also find Howard playing himself in the movie Atari: Game Over playing on Showtime right now.